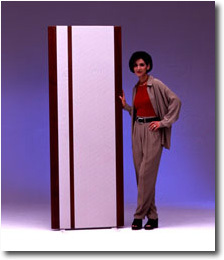 Some people call these speakers "ribbons" or "Quasi Ribbons". How I define a ribbon you can see elswhere (Ribbons). A magnetostatic work in a way like a ribbon but it has a base of some kind (mylar or kapton) on which the conductor is glued. The coil or conductor is often made of aluminium to keep the moving mass low. 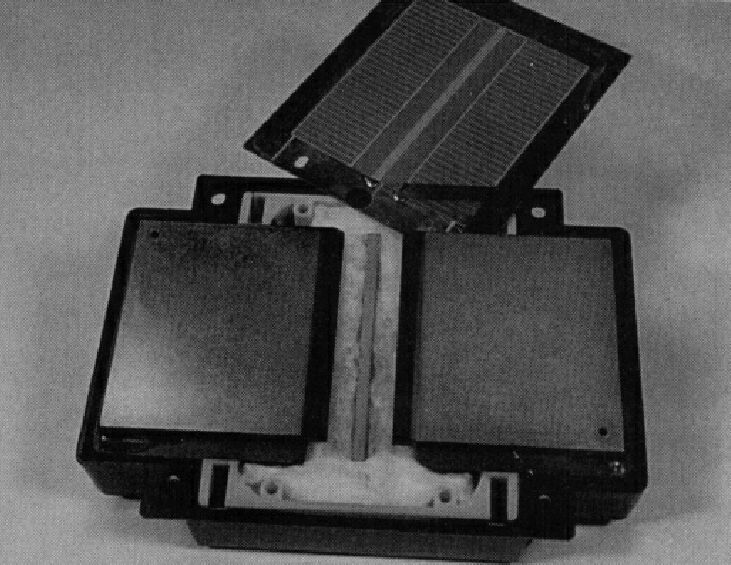 Most magnetostatics use a very thin flat conductor, but some still use thin wires glued to the base. They call it a ribbon, but I think it's a magentostatic. Anyway the specs are very impressive. 110 dB sensitivity and a max peak of 2.500 Watt certainly is far more than we need for normal "in house" listening. 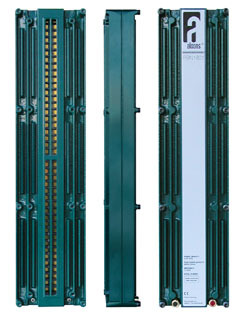 "The RBN1801 is an 18" professional ribbon transducer with a peak power handling of 3000W. and is currently the most powerful ribbon driver on the market. It features two patents. 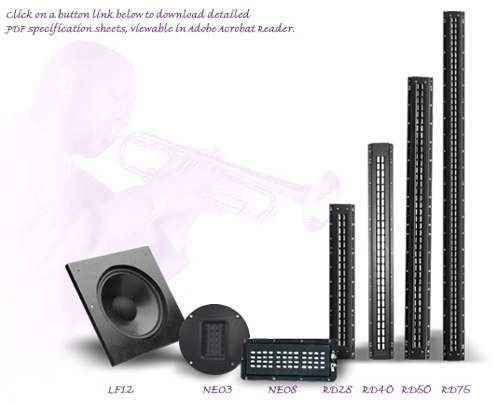 Alcons’ RBN transducers are the only pro-ribbon drivers with “Real-90” horizontal dispersion up to 20kHz. 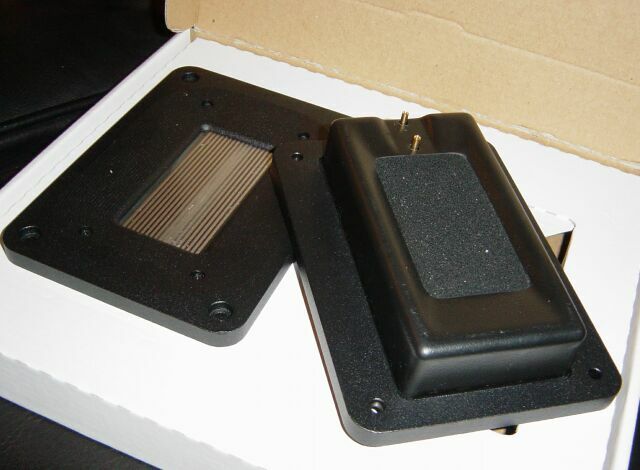 Alcons' ribbon drivers were developed by Philip de Haan, sr. R&D engineer and 20+ year veteran in ribbon transducer technology. He is initiator of a number of significant patents and can be seen as "father" of today's high-output pro-ribbon technology." The Danish Raidho FTT75 Planar Tweeter is designed and manufactured entirely by Raidho (Michael Børresen). This driver is used throughout the Eben X-Streme Series. 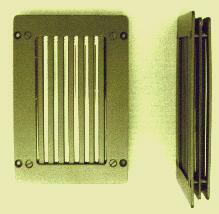 The planar diaphragm operates as a sealed unit, constrained right around its periphery, which according to the manufacturer delivers a unique balance of virtues: an extremely low moving mass, exceptional extension and power handling, but most importantly of all, ideal dispersion characteristics when it comes to integration with a conventional dynamic driver. The end result is a performance that extends from 3.5 KHz to beyond 50 KHz, yet does so with totally convincing speed, resolution and dynamic integrity. The Raidho can be used at lower frequencies than 3.500 Hz, but a gentle roll off from this freqency and down should be taken into consideration. Sensitivity is stated as 93dB/1W. The "Maggies" may be the most popular and certainly the most well known magnetostatic. Please note that the top range is a real ribbon! 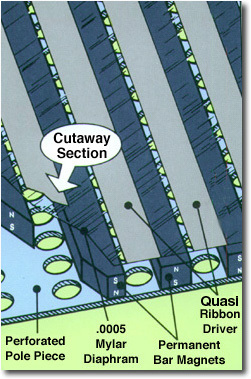 The Quasi-Ribbon shown is basically the same driver used for the mid and low frequencies of the Magneplanar speaker with the infusion of a heavier gauge wire replacing the thin aluminum ribbon. Using a .0005" Mylar diaphram and a .001" ribbon this diapole, cabinetless design leaves the sound uncoloured by box resonances. The electronic properties of this design requires no transformer between amp and speaker. The flat impedance and power responce are kind to your amplifier. 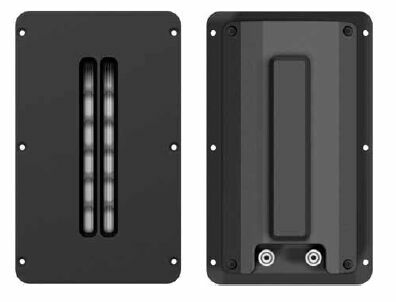 The LFT-10 will offer a new range of flexibility to the installer because of its thin profile and reduced space requirements behind the speaker. The useable frequency range is from 400Hz to beyond 20Khz. Narrow directivity requires on axis or reflective positioning and assures excellent imaging. Sensitivity - 86dB @ 1Khz @ 1 meter on axis. Impedance - 6 ohms purely resistive weight - 4lbs. size - Length - 7" Width - 5" Thickness - 1"
I bought these - see pictures and measurements. A "ribbon" from Greece? Yes, this country not normally connected with loudspeaker manufacturing has come up with this gem of a magnetostatic called PL-160. With the PL-160 Dynasonic takes the technology of planar transducers a step forward. This monopolar planar speaker, is the result of a three year development work, in cooperation with the ministry of technology in Athens Greece. dense field of a Neodymium magnetic structure. The Neo8 features a push-pull magnet system that has been designed with the help of Finite Element Analysis software to achieve optimum efficiency/cost performance. The purely resistive impedance of the Neo8 makes an easy load for a power amplifier and greatly facilitates crossover design. 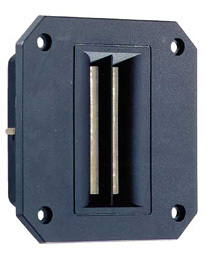 The magnet system is completely shielded for safe implementation in multimedia and A/V systems. * Net weight: 1 lb. The PRD1000 is a high performance planar ribbon driver with very high sensitivity/output capabilities developed for wide range of professional and consumer applications were highest quality accurate sound reproduction is required. 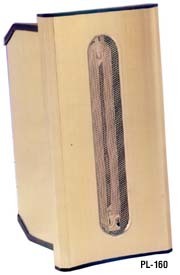 KaptonÆÊ diaphragm, massive cast aluminum body, direct contact gold plated binding posts, proprietary cooling technique, symmetrical push-pull Neodymium magnet system. The PRD1000 driver can be used with its standard flat face plate or with specially designed cast aluminum 70° x 40 ° horn. As far as I can see these may be OEM product sourced from Stage Accompany.